Galaga is my favorite arcade game of all time, so when I found out that there was a sequel on the Turbo, I had to play it. Galaga ’90 is actually the fourth title in the series, preceded by Galaxian, Galaga, and the lesser-known Gaplus. Galaxian’s game play was similar to Space Invaders, except that the aliens in the formation would fly down and attack you. 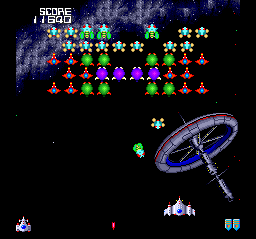 Galaga expanded on this by having the enemies fly onto the screen and attack your ship before slipping into formation. Galaga ’90 retains the same basic format and style as Galaga but has updated graphics and sound, and has vertically scrolling sections complete with boss battles interspersed between groups of traditional stages. While Galaga allowed you to let your ship be captured by the enemy so that you could reclaim it to form a double ship, Galaga ’90 kicks it up a notch by allowing that double ship to be captured as well. If you successfully reclaim it, you will form the dreaded “Triple Galaga”, which looks like the original ship on steroids and shoots three projectiles at a time. All of the familiar enemies from Galaga are back, joined by a number of new creatures. Galaga ’90 also features dimensional travel; warping to a higher dimension increases the difficulty but also increases the points earned through bonuses. Each dimension also has slightly different enemies and boss battles. Dimensional gates are opened by collecting blue orbs (called canisters) that are occasionally dropped by enemies or found inside of asteroids. Possession of two of these canisters at the end of a “galactic dancing” bonus stage will cause the dimensional rift to open, and your ship will automatically pass through it. The addition of these extra dimensions increases the game’s replay value by creating even more game variety. Galaga ’90 is easily the best game in the series, and is a must-have for any TurboGrafx owner. Although it isn’t as common as some of the system’s library, it can easily be found in the $10-20 range (as of this writing, anyway) and is well worth the price. Buy Galaga ’90 on GameGavel or Amazon. Tagged Arcade, Galaga, Galaga '90, HuCard, Namco, nec, Review, Shooter, turbografx, turbografx-16. Bookmark the permalink.